In GD&T the Profile of a Line symbol is used to establish a tolerane zone around a line in a feature. It might be used to specify the 2-dimensional tolerance for a line that is the cross section of a surface, for example. So, the tolerance zone is two parallel lines to the ideal line of the feature, separated by the tolerance. The actual line must fall entirely between the two lines making up the tolerance zone. Profile of a Line is seldom used for simple features as there are simpler ways to tolerance a radius or a simple straight line. 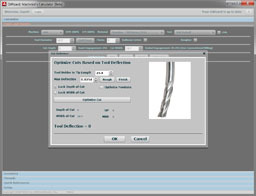 Instead, it is used to define tolerances for complex surfaces. Think of complex curves on aircraft parts or automobile body parts. Given the complexity of measuring errors in cross sections, Profile of a Line is usually measured with a CMM. If a relatively simple profile is called out, it can be possible to sweep the feature with an indicator and verify the tolerance.. Above is a typical example of a callout for Profile of a Line on a drawing.